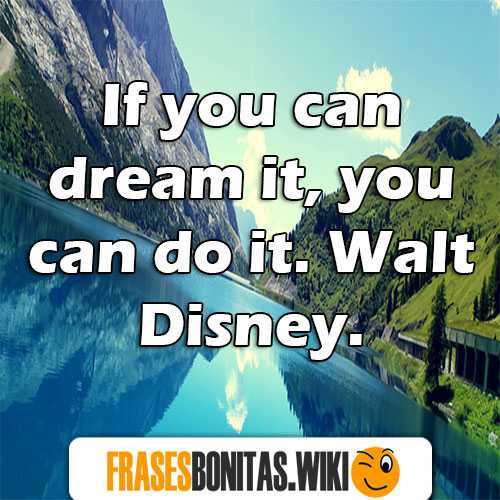 Muchas veces, cuando queremos transmitir o compartir un mensaje a través de las redes sociales, elegimos la lengua de Shakespeare en vez del idioma español, y por ello, hoy hemos decidido hacer este recopilatorio de frases en inglés traducidas muy bonitas y cortas, donde encontrarás las mejores de amor, sobre la vida, de superación o para compartir por WhatsApp o incluso Tumblr. Ya sea para colocar en tus estados o para incluso iniciar o mantener una conversación en inglés, aquí encontrarás las mejores citas con imágenes lindas. I love you not only for what you are, but for what I am when I am with you. Roy Croft. I believe love produces a certain flowering of the whole personality which nothing else can achieve. Ivan Sergeevich. In dreams and in love there are no imposibilities. Janos Arnay. A kiss is a lovely trick, designed by nature, to stop words when speech becomes superfluous. Ingrid Bergman. Make me immortal with a kiss. Chistopher Marlowe. Is better to have loved and lost, than never to have loved at all. Lord Tennyson. Love asks me no questions, and gives me endless support. William Shakespeare. To love and win is the best thing. To love and lose, is the next best thing. William Thackeray. 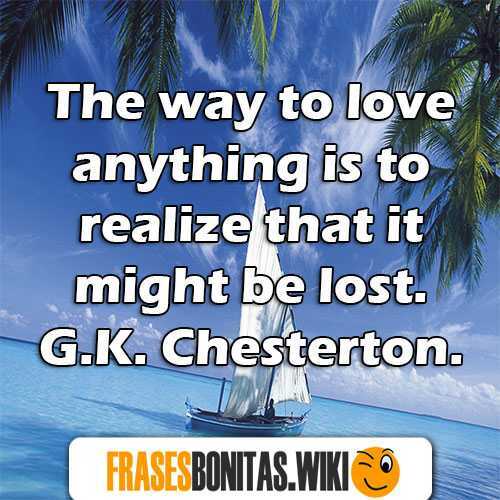 The way to love anything is to realize that it might be lost. G.K. Chesterton. Smile, it’s free therapy. Douglas Horton. Only I can change my life. No one can do it for me. Carol Burnett. We do not remember days, we remember moments. Cesare Pavese. While there’s life, there’s hope. Marcus Tullius Cicero. When love is not madness, it is not love. Pedro Calderon de la Barca. The purpose of our lives is to be happy. Dalai Lama. Don’t cry because it’s over. Smile because it happened. Dr. Seuss. Only do what your heart tells you. Princesa Diana. Try to be a rainbow in someone’s cloud. Maya Angelou. Love is the beauty of the soul. San Agustín. I’m selfish, impatient and a little insecure. I make mistakes, I am out of control and at times hard to handle. But if you can’t handle me at my worst, then you sure as hell don’t deserve me at my best. Marilyn Monroe. 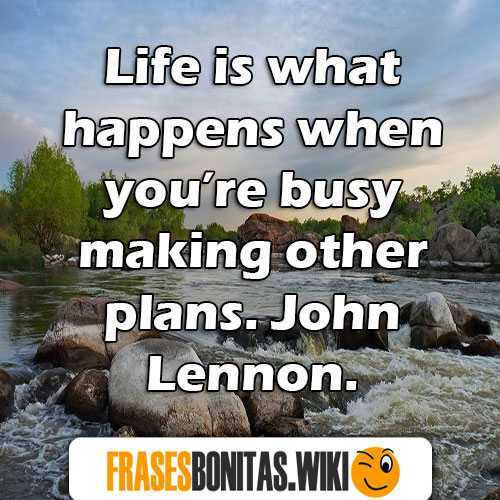 Life is what happens when you’re busy making other plans. John Lennon. When one door of happiness closes, another opens; but often we look so long at the closed door that we do not see the one which has been opened for us. Helen Keller. Great minds discuss ideas; average minds discuss events; small minds discuss people. Eleanor Roosevelt. Challenges are what make life interesting and overcoming them is what makes life meaningful. Joshua J. Marine. 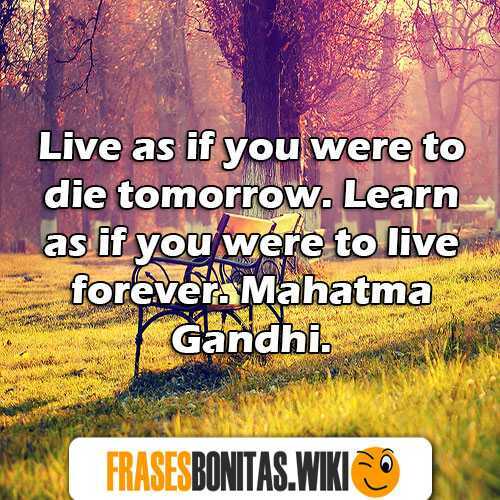 “Donde hay amor hay vida” Frases cortas pero que lo dicen todo de Mahatma Gandhi. Preciosas y breves palabras. Where there is love there is life. (Mahatma Gandhi). With love and patience, nothing is impossible. 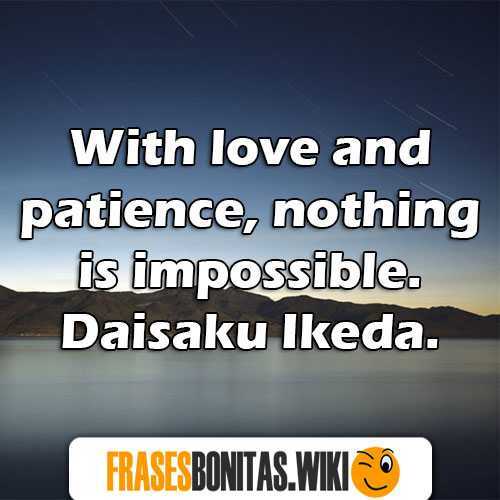 Daisaku Ikeda. Be happy for this moment. This moment is your life. Omar Khayyam. A goal is a dream with a deadline. Napoleon Hill. Believe and act as if it were impossible to fail. Charles Kettering . My night has become a sunny dawn because of you. Ibn Abbad. A man is a little thing while he works by and for himself, but when gives voice to the rules of love and justice, he is a godlike. Ralph Waldo Emerson. Twenty years from now you will be more disappointed by the things that you didn’t do than by the ones you did do. Mark Twain. When I dare to be powerful – to use my strength in the service of my vision, then it becomes less and less important whether I am afraid. Audre Lorde. The only impossible journey is the one you never begin. Anthony Robbins. Life isn’t about finding yourself. Life is about creating yourself. George Bernard Shaw. 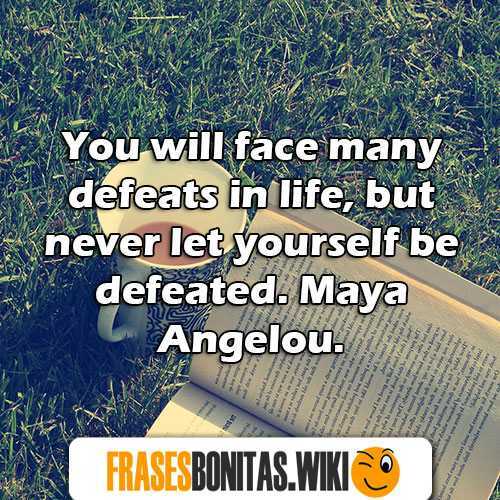 You will face many defeats in life, but never let yourself be defeated. Maya Angelou. Life is really simple, but we insist on making it complicated. Confucius. A man who dares to waste one hour of time has not discovered the value of life. Charles Darwin. It does not matter how slowly you go as long as you do not stop. Confucius. Too many of us are not living our dreams because we are living our fears. Les Brown. Everything you’ve ever wanted is on the other side of fear. George Addair. Permanence, perseverance and persistence in spite of all obstacles, discouragements, and impossibilities: It is this, that in all things distinguishes the strong soul from the weak. Thomas Carlyle. It’s not about perfect. It’s about effort. And when you bring that effort every single day, that’s where transformation happens. That’s how change occurs. Jillian Michaels. Once you choose hope, anything’s possible. Christopher Reeve. You can’t please everyone, and you can’t make everyone like you. Katie Couric. A dream doesn’t become reality through magic; it takes sweat, determination and hard work. Colin Powell. Espero que nuestros mensajes y frases en ingles traducidas te hayas gustado. Hemos intentado encontrar para ti las más bonitas y cortas citas inglesas para compartir en tus estados de WhatsApp, Tumblr o cualquier red social. Si te han gustado o piensas que le pueda gustar a alguien, no dudes en compartirlo para que más personas puedan deleitarse con nuestras palabras. ¡Hasta pronto!